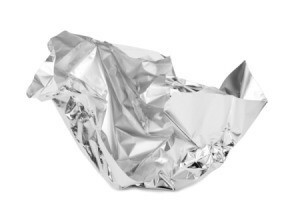 Foil can often be reused by cleaning with baking soda and water. Depending on the quality and thickness of the foil you may be able to get multiple uses from a piece. This is a guide about reusing aluminum foil. If you choose to reuse aluminum foil, consider buying the new "nonstick" variety. Yes, it definitely costs more initially, but I've found that the heavier, nonstick sheets are easier to clean, and hold up remarkably well after repeated uses. It saves you money every month. Use your foil, rinse with baking soda and water mix. Make the final rinse water and carefully fold and put to the side. Change foil when it retains a hole or large rip and is not reusable!